Structure of springtail (Collembola) communities in the urban green of Warsaw. Structure of leaf beetle (Coleoptera, Chrysomelidae) communities in the urban green of Warsaw. 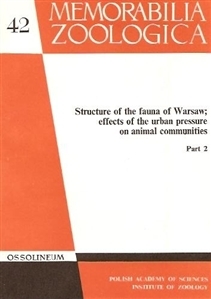 Structure of wasp (Hymenoptera, Vespoidea) communities in the urban green of Warsaw. Effects of anthropogenic pressure on Vespoidea and Sphecidae communities. Structure of leafhopper (Homoptera, Auchenorrhyncha) communities in the urbangreen of Warsaw. Effect of anthropogenic pressure on leafhopper (Homoptera, auchenorrhyncha) guilds. Noctuid moth (Lepidoptera, Noctuidae) communities in urban parks of Warsaw.